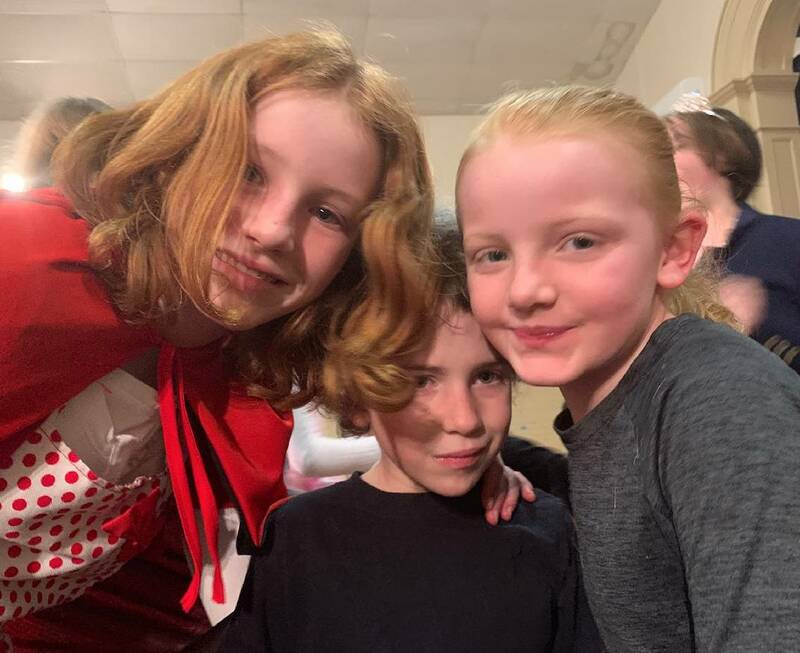 From left, Tilleigh, 12, William, 6, and Evie, 8, at Skwalking Heads Productions' dress rehearsal for "The Big Bad Musical." Seven years and a dozen or so plays later, my granddaughter, Tilleigh, 12, is a bona fide actress. Thanks to the incredible, compassionate and professional instruction from Colleen Laliberte, Tilleigh has gone from being a background player to performing lead roles for "Miss Colleen," executive director of Skwalking Heads Productions. The plays are held in the old Bachman Elementary School, just a couple miles from my home on Signal Mountain. My daughter and grandchildren live next door to me. While Tilleigh has found her comfort zone in acting, her sister, my second granddaughter, Evie, 8, has found hers in the water. She's a competitive swimmer, a sport she loves. She's a natural athlete and one of the area's top swimmers in her age division. Evie and William are devoted fans of Tilleigh. They have not missed a play, sometimes seeing as many as five or six of the same production. Because of this, they expressed an interest of being onstage as well. Evie has been in a couple plays, and, just recently, William was in his first. The kids participated in the Skwalking Heads production of "The Big Bad Musical." Tilleigh had been in the play before, and it was one of Evie's favorites. When Evie said she wanted to be in it, William wanted in, too. While Tilleigh and Evie are outgoing, William tends to be shy (except around family and close friends). So our family was shocked that he was willing to be onstage in front of an audience. Turns out, though, the play was going to be held when my husband and I were on our annual February trip to Jamaica. I was heartbroken that I was going to miss it. Thankfully, Miss Colleen let me attend the first dress rehearsal that was held the night before we left. It was the children's first night in costume. It ran fairly smoothly, with just a few hiccups of forgetting lines. The kids, who appeared to be ages 5-13, have been practicing for several months. They were amazing. Tilleigh played a lead role as Little Red Riding Hood, while Evie was the head wolfette and William was a little wolf. They, along with a few other little wolfettes, performed a song in front of the stage, accompanying the Big Bad Wolf, played by Benjamin Daniel. For a lot of the play, the little wolves, who mostly appeared to be ages 5 or 6, sat in small chairs on the stage. They were in the audience in the trial of the Big Bad Wolf, so they were onstage during the majority of the performance. And when you have little wolves sitting around, they're going to be antsy, especially during their first dress rehearsal. William and the little girl seated next to him chatted to one another throughout most of the play. William fiddled with his costume, taking off his wolf ears and tail and dropping them on the floor. He even raised his pants leg to show his fellow wolfette a scab. The scab was quite the conversation piece for a few minutes. But when it was time for the Big Bad Wolf and the smaller wolves to perform a song, William stood right in front of the microphone (which stood a few inches above his head), got on his tiptoes and belted out the song. I was shocked. Where was my shy little guy? I am convinced that acting is something every child should experience. There wasn't one child onstage who appeared frightened. (I still don't like speaking in front of an audience, and I'm 66.) I've seen the positive effects acting has had on Tilleigh, and I also see it in Evie and William. Whether or not Evie and William choose to pursue acting, they've already learned a lifelong skill by participating in a production. It's a confidence-building activity that I didn't know existed until my grandchildren began acting, and I'm impressed as heck. Tilleigh, though, will continue acting. Though she swims in the local summer swim league, it's acting that's her passion. She auditioned and was accepted last summer at Chattanooga High School Center for the Creative Arts, where she's majoring in theater. I've got a lot more plays — and swim meets — to attend in my future, thanks to my grandchildren. Whatever the future holds for all five of them, as long as I can, I'll be their devoted fan. And who knows, my little California girls may become surfers one day. Now wouldn't that be fun to write about? Contact Karen Nazor Hill at khill@timesfreepress.com.